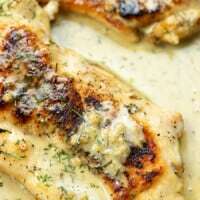 Creamy Lemon Chicken with garlic- that buttery lemon sauce is AMAZING! 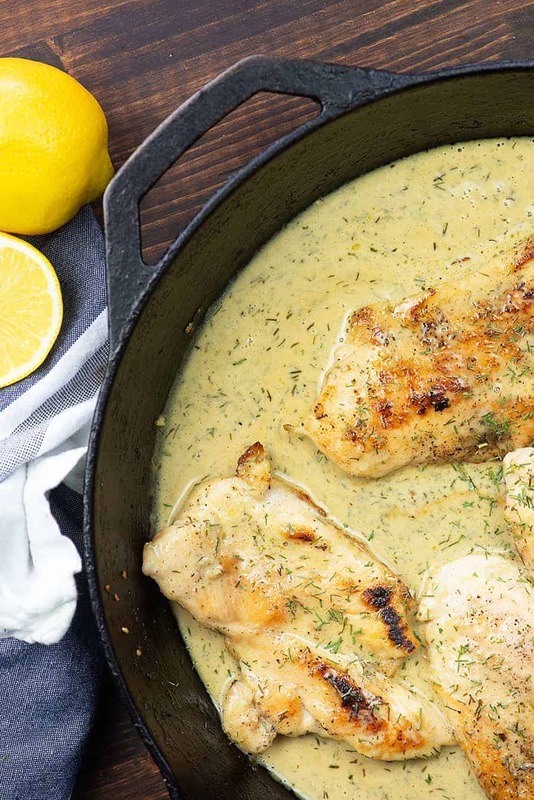 Lemon garlic chicken in a creamy sauce, all made in on skillet! This low carb chicken recipe comes together in just 20 minutes! Lately, I’ve just been obsessed with lemon. I think it must be the weather changing and warming up outside. Citrus just tastes like summer to me. So, now that I have a bowl full of lemons on my counter all the time, I figured I’d better start cooking with them! 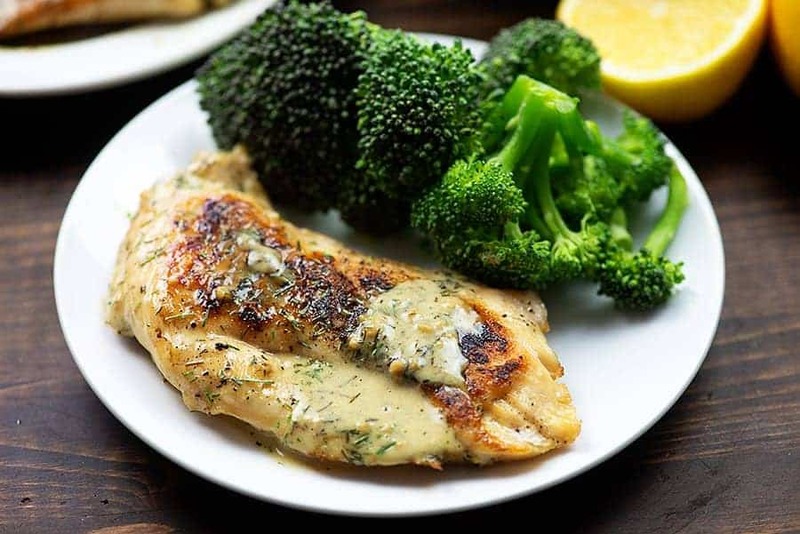 This lemon garlic chicken is outrageously good and it’s naturally low carb and keto friendly. Love it when recipes are both healthy and packed with flavor, don’t you? 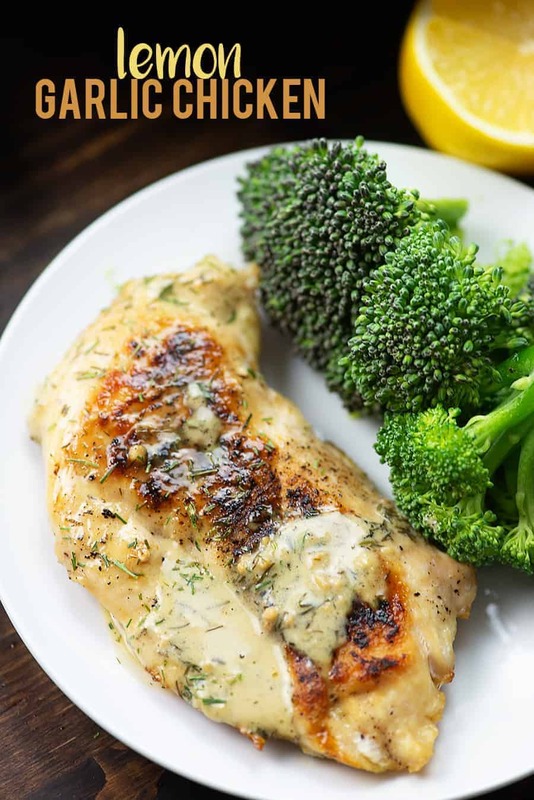 This lemon garlic chicken recipe comes together in about 20 minutes with just 2 net carbs per serving! Let’s do this! You’ll want to start with thin-sliced chicken breasts. You can either purchase them already thinly sliced or you can butterfly regular chicken breasts yourself. Either works! I season my chicken with a bit of salt and pepper and then brown them in a skillet. Remove your chicken and deglaze the pan with some chicken stock. Deglazing just means that you add liquid to the hot skillet you cooked your chicken in and whisk well to scrape all the browned bits up off the bottom of the pan. Don’t skip this step, because it adds a ton of flavor! Squeeze in some lemon juice and let the liquid reduce by half over medium heat. Stir in some butter and cream to make the sauce rich, creamy, and oh so flavorful. Return your chicken to the pan and let it simmer in the sauce for a couple of minutes and sprinkle with fresh dill. We like to serve this creamy lemon chicken with steamed broccoli on the side, but my loaded cauliflower casserole is tasty too! Spinach Stuffed Chicken: This one was an instant hit here on the blog and for good reason! It’s easy, healthy, and full of goodness. Slow Cooker Chicken Wings: These wings start in the slow cooker and then crisp up under the broiler. Easy!! Low Carb Taco Soup: This recipe includes instructions for pressure cooking and slow cooking. Cauliflower Chicken Fried Rice: This is one that my kiddos love for a quick lunch. I start with shredded cooked chicken and the whole thing comes together so quickly! 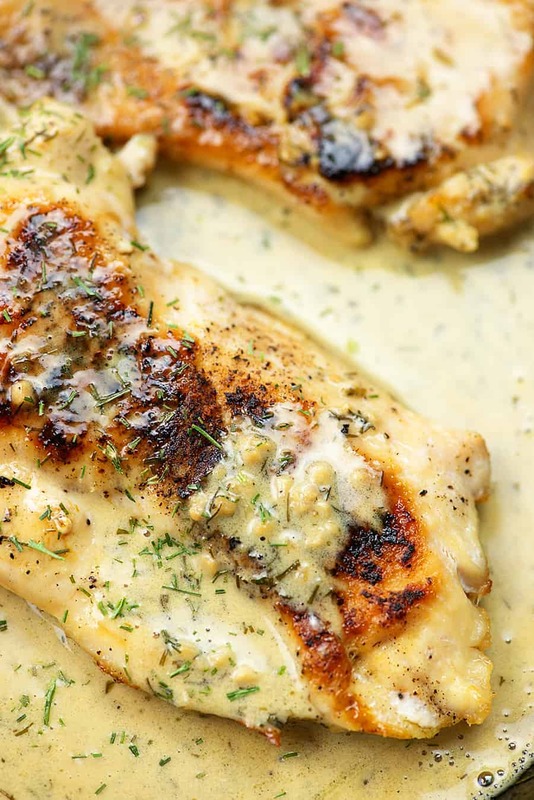 This creamy garlic chicken is bursting with citrus flavor! It's ready in about 20 minutes, too! Heat a large, heavy-bottomed skillet over medium heat. Add the oil and heat until shimmering. Add the chicken to the skillet and cook until browned on each side and cooked through, about 8 minutes total. Remove chicken to a plate and set aside. Add the chicken stock, to the pan and whisk to deglaze the pan. Add the lemon juice and garlic to the pan and bring to a boil over medium heat. Allow chicken stock to reduce by half, about 10 minutes. Whisk the butter and cream into the chicken stock until butter has melted and mixture is smooth and creamy. 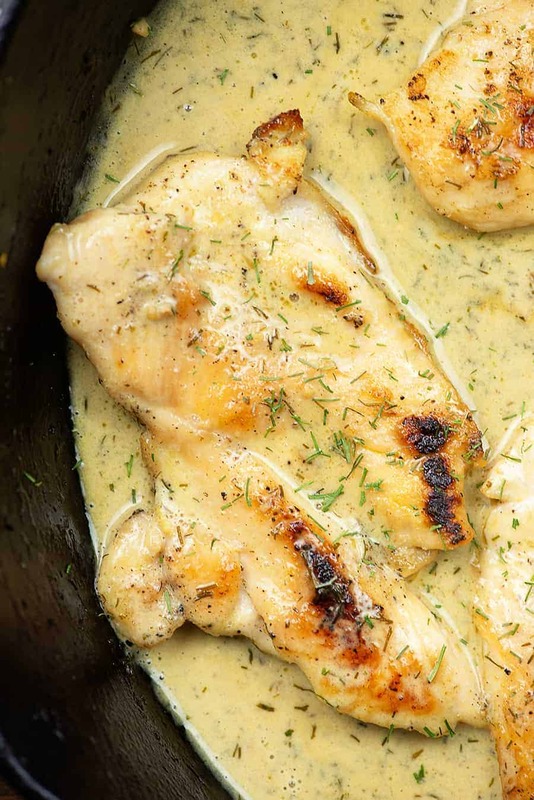 Return chicken to the skillet and sprinkle with fresh dill. Cook for 1 minute to rewarm the chicken. Dad & kid approved! Thank you! This will be a staple dinner in our house from now on! Can I use buttermilk instead of heavy cream? Trying to avoid a trip to the store. Not sure that would work…buttermilk has such a different flavor than cream. I just used water. I’m not doing any specific diet but don’t really keep dairy around outside yogurt, so I thickened mine a little with some cornstarch + water. I also just tossed the broccoli in to steam a bit while the sauce was thickening. Still super delicious! A few days ago I made something similar with yogurt + lemon marinated chicken and it was delicious. I think you could also use some plain yogurt with it and possibly thin it down a little if you want. It wouldn’t be exactly the same, but I think the same flavors in slightly different arrangements are good. I made this Whole 30 Compliant and it was awesome. Swapped out butter for ghee and extra chicken broth with some arrowroot for the cream. Adding to my make again pile! The only thing I changed was to add extra garlic. Easy and delicious…PERFECTION! I have made this twice now, once without dill and once with dill and both times it was fantastic! It’s an incredibly simple to prepare dish and it’s become a go-to in our house! Made for dinner tonight! Doubled the sauce served over sauteed zucchini and red pepper. I sliced the chix thin and then put back in the sauce. Love the taste of the dill in this recipe. Will make again! This was VERY good! I didn’t adapt it at all but next time may reduce a little dry white wine for depth. I served it over some high fiber pasta and the sauce was more than plentiful. Added a little roasted broccoli and it was a great meal! Both my boys gobbled it up. Thanks so much! Great Recipe. Thanks so much. Someone before mentioned that this recipe is so adaptable and that is very true. I don’t like dill so I used parsley flakes, used chicken thighs instead of breasts and served with saffron rice and asparagus. Excellent. Hands down the best chicken I’ve ever had. My stove is new & apparently runs hot, so my broth mixture reduced way too far, way too fast, but I was able to save it, & it was still amazing. Very forgiving recipe! I sautéed some whole green beans in the same skillet with the leftover sauce remnants, then tossed them in the sauce with the chicken (I only fixed one breast, so there was plenty). That sauce tho…I literally licked my plate, and I AM NOT ashamed. I want this chicken every day. Yay!! So glad the recipe was such a success! I bet that sauce was great with green beans! I wouldn’t use milk in this recipe as the sauce will be much thinner. Wonderful & wonderfully simple recipe. Made for dinner tonight. I sauteed some leeks & mushrooms and added capers to the final warming. I didn’t have dill but, didn’t make a big difference. Huge hit in my house. Thank you! Sounds great with the capers! Forgot to mention that I served with jasmine rice & petit brussel sprouts. Again, thank you for great recipe. I made this tonite. OMG! It was delicious! My husband wants it again. I made the recipe just as it was, because why change it, and it turned out great. Going to try it on fish. Delicious!!! This was delicious and so easy! We made it because we happened to have everything on hand and couldn’t be happier. Definitely a keeper! Made this tonight in Australia! Absolutely A M A Z I N G! thank you for sharing! !